Females, a high pitched quack. 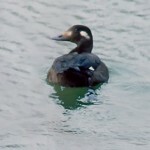 Displaying males, a high whistled note. Description: Small duck. Blue-gray head with white cresent in front of eye. Breast and sides with black spots. Female mottled brown. In flight both sexes show a blue patch on the forewing, with a green speculum. 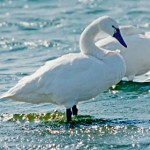 Habitat: Shallow ponds, ditches, and marshes. Rarely in deep water. Usually breeds in marshes surrounded by prairie and grassy meadows. 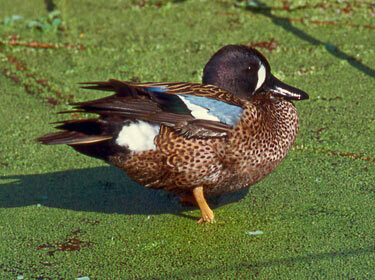 Look for this small teal in flooded fields, in water filled ditches and along edges of streams, marshes and wetlands. 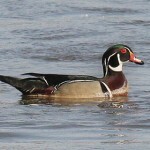 Where in Nebraska: Abundant regular spring and fall migrant. Uncommon-locally common regular breeder statewide. Fun Facts: Blue-winged Teals are among the last to migrate north toward the breeding grounds and the first to leave and migrate toward the wintering grounds. Additional Information: The Blue-winged Teal breeds in every state and province in the United States and Canada. The highest concentrations seem to ocurr in the northern Great Plains.